Four artificial lakes in the densely forested mountains of north California are the main attractions of the Whiskeytown-Shasta-Trinity National Recreation Area, a 203,587 acre preserve that contains the reservoirs and extensive areas of hilly, undeveloped land all around. The NRA is split into three sections (see map), all north or northwest of Redding along interstate 5, most visited being the Whiskeytown Unit, administered by the National Park Service; this has easy access to most parts of the shoreline and plenty of facilities, concentrated on water-based activities but including many hiking trails into the neighboring hills. 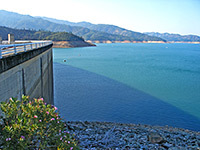 The other two sections of the NRA are administered by the US Forest Service; largest is the Shasta Unit, based on the branched Shasta Lake, which has 370 miles of shoreline, the majority reachable only by boat, since access by paved road is limited to several areas along I-5 and a small area around Shasta Dam. The dam is one of the largest in the US, and a major component of the Central Valley Project which diverts water from the abundant rivers in the north to the much drier agricultural areas in the center of the state. The third, most remote and least visited section of the NRA is the Trinity Unit, which contains two adjacent lakes (Trinity and Lewiston) on the Trinity River, and also has rather limited access by land. The NRA is not particularly outstanding scenically, as all the lakes are surrounded by identical hills, moderately steep and thickly wooded; there are no dramatic mountain summits nearby, and no sheer cliffs or exposed rocks around the lakes - in keeping with its designation, people come here mostly for recreation, on land and water, and to visit several historic sites, relics of the Gold Rush period of the mid 19th century. Redding is the only major nearby town with chain hotels - follow the link for hotel descriptions and location map. NRA overview map, Whiskeytown Unit map (PDF file - 1.4 mb). where most facilities are found, including a visitor center, three marinas, several beach parking areas, campsites and picnic areas. The road becomes unpaved after 6 miles but remains suitable for all vehicles, and meets Hwy 299 again at the upper end of the lake. Trails, other roads and 4WD tracks lead into the extensive wooded hills to the south, to such locations as the summit of 6,199 foot Shasta Bally, elevated viewpoints of the lake, old gold mines, and several small but pretty cascades on mountain streams (Brandy Creek Falls, Boulder Creek Falls, Crystal Creek Falls and Whiskeytown Falls). Many routes are open to horse riders and mountain bikers as well as hikers. The outlet of Brandy Creek is the main beach area - a long, shallow, sandy inlet about half way along the south shore, near a campsite and marina; other centers for visitor activities are along the north shore at Oak Bottom and Whiskey Creek. 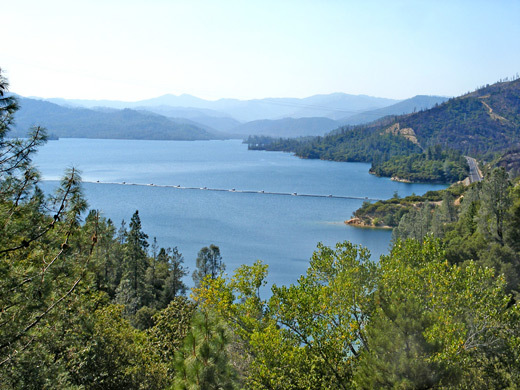 Whiskeytown Lake was formed in 1963 by construction of Whiskeytown Dam, a small, low, earthen structure lined by rocks. The south shore road runs across the top, past one other feature of interest - the Glory Hole, which is a huge spillway vent 260 feet deep, used to remove excess water if the lake level rises too high. The hole is coned off to prevent boat-based sightseers from approaching too close, but is easily viewable from the shore. Shasta is a very large lake, the biggest reservoir in California, with four main branches, along the Sacramento River, McCloud River, Pit River and Squaw Creek. Most activities in the Shasta Unit of the NRA are concentrated in the north, where I-5 crosses the Sacramento River Arm near Lakehead, and in the south, at Shasta Dam. 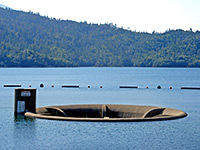 The dam is reached by a loop road west of the town of Shasta Lake, and it presents quite a dramatic spectacle, spanning a wide valley and surrounded by steep hillsides. The structure is 3,460 feet across and 602 feet tall, with a huge power generating plant at the base, and lies at the center of a sizeable complex of buildings and service roads, all closely monitored by security police. The top of the dam is open to pedestrians only, and free, hour-long tours are provided through the power generating rooms, while a few parts of the nearby shoreline (to the east) are accessible for fishing or boat launching. Apart from the dam, the only other sections of the lake easily reachable by road are along I-5, which crosses the main part of the lake in the south, and again, via a shorter bridge in the north, and has various side tracks leading to beaches, campsites, picnic areas and boat launches. All the lengthy shoreline has a similar appearance; quite steeply sloping and uniformly forested, bordered at times of low water by a narrow band of reddish earth, and even more than the Whiskeytown Unit, Shasta is primarily used by water-based recreationers, rather than hikers or photographers. The road through the Trinity Unit is paved though narrow and bendy, branching off Hwy 99 twenty nine miles west of Redding, and for 45 miles following beside or close to the west shore, initially past the narrow Lewiston Lake and then (after joining Hwy 3) the much larger Trinity Lake. En route are many primitive campsites, boat launches and trailheads, plus several small villages that provide basic visitor facilities.